Whether the following products are for your better half, or you ARE the better half, they come as a welcome addition to the available selection of women's gear. These items will perform just as well on the pillion as they will from the hot-seat. 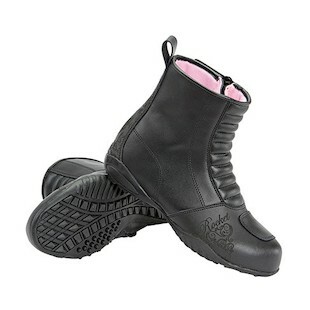 Waterproof, flexible, and anti-slip, the Joe Rocket Women's Trixie Boots are a streamline statement of two-wheel pride. While tough and protective in nature, the laser etched art and fuzzy pink interior balance the armor and leather with a more feminine decor. The Trixie undercut most of the market, coming in under $100. You'll probably spend more on gas for your bike this week than on this next item. 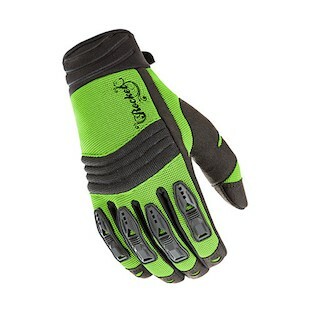 The Joe Rocket Women's Velocity Gloves come in just over $20. They define ultra-affordable protection, providing reinforced knuckles, vented TPR finger armor and a pre-curved design for added comfort. The Velocity Gloves come in Black or three high speed colors of your choosing: Purple, High-Viz, or Pink. 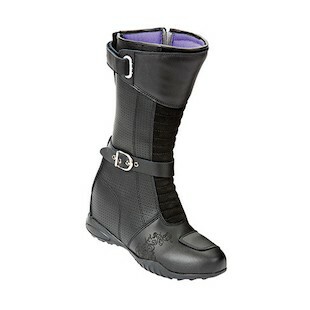 This last boot is a fashionable high-calf solution with a secret weapon tucked inside. Hidden behind the heel protection and underneath the decorative buckles is a 2.5" wedge heel, which is not visible from the outside. This undercover feature will add perspective to your ride, while the low profile toe-box and articulated suede detailing reinforce the sleek curves of the Joe Rocket Women's Heartbreaker Boots. We expect to see these hit the shelves in mid-March, so they will be a bit late to work as a Valentine's Day Gift. Regardless, we think that any of these would go perfectly with a box of chocolates.